Jaguar has recently widened options for customers by introducing a petrol version of the F-Pace in India. The Jeep Wrangler and the Jaguar F-Pace have distinctive styling elements, where one has an old-school charm while the other has a modern stance. Here below are key elements that distinguish it from the other. The F-Pace gets a distinctive large mesh family grille and sleek bright adaptive headlights. The SUV has a sloping roofline along with more pronounced rear haunches and slim taillights for a sporty stance. Jeep Wrangler appears as the no-nonsense looking thing with its boxy shape, sturdy silhouette and wide panel gaps adding to its character. The large bumpers along with a signature seven-slat grille and round headlamps give it a rugged character. From the rear, the Wrangler with the black plastic roof and the boot mounted large wheel looks macho and the slim bumper complete the look. The petrol variant of the F-Pace is available with features like Park Assist, Lane Keep Assist, Cabin air ionisation, driver condition monitor, 360-degree parking sensors, adaptive LED headlights, Wi-Fi hotspot and pro services and a 10.2-inch touchscreen. Additional changes for Model Year 2019 include illuminated metal treadplates, chrome switches for the 10-way seats, suede cloth headliner and bright metal pedals. The Wrangler’s cabin looks quite modest as compared to the F-Pace. The vehicle offers an all-black interior theme with large circular AC vents and inserts. The cabin appears roomy with a high seating position, slim pillars and large glasshouse visibility. 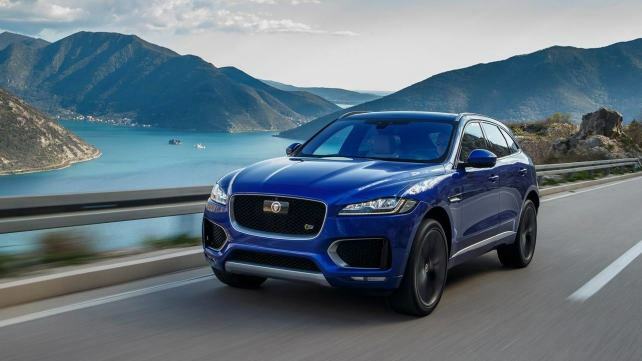 The petrol Jaguar F-Pace is powered by a 2.0-litre, four-cylinder, turbocharged Ingenium petrol engine that generates 247bhp and 369Nm of torque. The petrol version of the Jeep Wrangler is powered by a 3.6-litre engine that generates a 3.6-litre engine that generates 280bhp of power and 347Nm of torque. The vehicle gets a standard all-wheel drive system. Among the two, the F-Pace has priced at Rs 63.17 lakhs, while the Jeep Wrangler is priced at Rs 58.74 lakhs (ex-showroom, Delhi). The F-Pace, however, offers more premium convenience features while the Wrangler can be the choice for those who like exploring uncharted horizons with a four-wheel drive system.